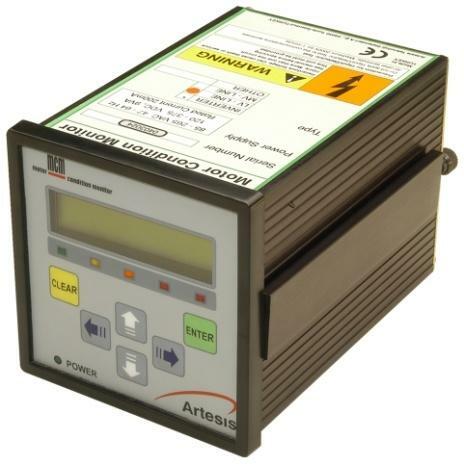 The flagship instrument sold by Industrial EKG is Artesis MCM, or Motor Condition Monitor. This state of the art device is a small instrument that installs quickly and easily in the motor control center and connects to your plant's information network, for trending and diagnosing system health. What's most people's reaction? "It's too good to be true." But it's real, it works, and we can prove it. Here's how it works. Much as a cardiologist can determine an amazing level of detail from an electrical measurement of body rhythms through an electrocardiogram – an EKG or ECG – the intelligence built into this instrument can do the same by detecting and analyzing minute variations in the electrical power supplied to the motor. In a novel, patented and completely unique approach, measured data is compared against expected behavior of a model that's based on a wide variety of motors in a database of over 10 million tested units. Results are presented not as traditional spectra or functions of voltage or current amplitudes, but as composite parameters scaled in standard deviations from the behavior of a normal system. Yes, it takes a little getting used to, but traditional condition questions like “how bad is it?” are easily answered and – finally – a thing of the past. Never before has all this functionality been brought together in one affordable device. Traditional instrumentation can of course measure all these characteristics, but not without integrating multiple instruments from multiple vendors and installing vibration, temperature and other sensors on the actual motor and driven equipment – none of which are necessary with our solution! How much does it cost? Surprisingly, you can get started for about the cost of a Tata Nano! Contact us for details. Or download, fill out and email our RFQ datasheet that shows the configuration information we will need to talk in detail about prices.